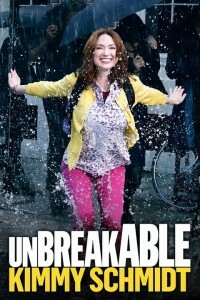 Kimmy Schmidt (Ellie Kemper) is a wide-eyed, enthusiastic young adult living in New York for the first time—but hers is not like all the other stories that begin this way. Kimmy was recently rescued from a doomsday cult in Indiana, where she was held against her will for most of her adolescent life. Unwilling to return home and be known forever as one of the “Mole Women,” Kimmy starts life fresh in the Big Apple by finding an apartment and a job. From the team behind 30 Rock, this quirky comedy brings a lot of enthusiasm and good-natured humor to an otherwise dark backstory. Kimmy will have the audience laughing with her day-to-day life and her cluelessness to pop culture, and fans of comedy will notice more than a few familiar faces, including Tituss Burgess, Carol Kane, Tina Fey, Jane Krakowski, Amy Sedaris, and Jon Hamm. (Fair warning: the theme song will be stuck in your head for at least a week after.) Watch the first season on Netflix—now available on our roku devices! At your recommendation I watched this show for the first time last Friday. I find it to be outrageously funny. Thank you so much for recommending it.